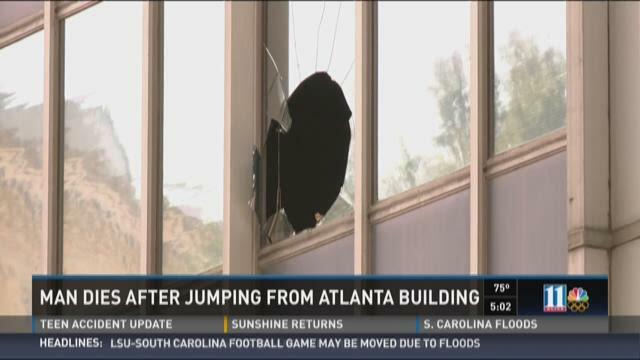 ATLANTA -- A man died after diving headfirst through the window on the third floor of a downtown Atlanta building while handcuffed on Tuesday, police said. He's been identified as Tyquan Richardson, 22, of Atlanta. According to Warren Pickard of the Atlanta Police Department, Richardson was at the Fulton County Superior Court Diversion Center at 34 Peachtree Street for a pretrial interview regarding a drug charge. A janitor discovered a loaded .25 caliber semi-automatic handgun and brought it building security. The gun had been concealed in documents that Richardson's name. Richardson was located and taken into custody and handcuffed. While deputies were completing paperwork, he was seated in a conference room. Investigators said Richardson told deputies that he did not want to go back to jail. He then got up and jumped through the window, falling about 40 feet, police said. "This man was coming out of the window backwards. He had handcuffs on," said a witness. "This man came out, hit his head on one of those poles, and he hit that ground. When he hit that ground, he was not moving." Richardson was unresponsive after landing on the sidewalk on Walton Street. He was taken to Grady Memorial Hospital in critical condition, where he later died. Several streets in downtown Atlanta were closed Tuesday afternoon as police investigated. Streets around that location were reopened around 12:50 p.m.